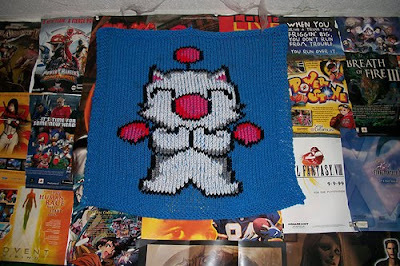 As with the wall hanging I decided to just knit the giant square and duplicate stitch the image on. It was very time-consuming doing this, but also very rewarding. 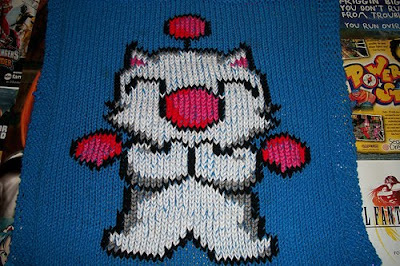 However, I didn't think ahead about the fact that I was using large needles and knitting the background loosely, so duplicate stitching wouldn't turn out as crisp and tight as I would have liked. All in all though, it came out quite nicely. I made the pattern from looking at an image of another project as there doesn't seem to be any patterns out there! I knit it back and forth on size 9 wooden circulars so my wrists wouldn't hurt as much as the square became heavier, and i just used a needle to duplicate stitch the image.